Some real world examples of how to turn your smartphone into a spiritual tool that can change your life, all without dunking your phone in the baptismal font. No, we are not suggesting you dunk your phone in Holy Water. Instead, we offer something a bit less destructive: some concrete ways to turn your smartphone into a spiritual transformation tool. For many people, a smart phone can be an addictive and source of temptation. Why not choose to use your screen time in a more focused, deliberate way? We have compiled a list of recommendations that allow your phone to become a tool that will strengthen your relationship with God. Although there are many recommendations in this list, it is best to start by picking one suggestion from each category. Do not become discouraged if you find some of these suggestions difficult! The important thing is discovering new ways to inject Christ into your daily routine. Disruption of your old daily routine is the goal, so start small and slowly build new habits. There are many Catholic prayers that we are encouraged to pray at specific times of the day. Setting an alarm (or even just a reminder) to pray at these special times will allow you to break from the hectic nature of your day and refocus on the immense grace that God wants to pour out to you. 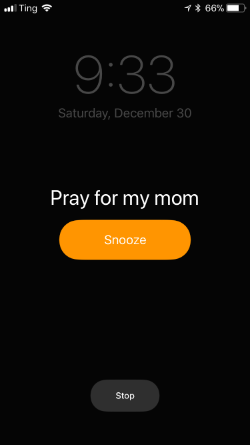 Most phones allow you to set a label with your alarm so that it not only will remind you to pray, it can remind you why you are praying. Set a single alarm during the day to remind you to pause and pray for people in your life. This pause can be for only a few minutes, but it can make an enormous difference for those whom you remember. Not sure whom to pray for? We've got you covered! See the Holy Lists section below, sign up for the Seton Prayer Chain, or even pray the same intentions as Pope Francis! You could also use this time as a reflective, mid-day Examen: "where has God been present in my day so far? ", "how has God spoken to me today? ", "where do I need God's help in my daily encounters?" Set an alarm for 3:00 p.m. and pray all or just part of the The Chaplet of Divine Mercy. The Divine Mercy Chaplet is a prayer given to St. Faustina by Jesus in 1935. Its purpose is threefold: to obtain mercy, to trust in Christ's mercy, and to show mercy to others. Set alarms for 6:00 a.m., 6:00 p.m., and one other time of your choosing to pray the major Liturgy of the Hours. The Liturgy of the Hours is a set of prayers said everyday by all priests around the world. Although it can be said every three hours, the major Hours are 6:00 a.m. ("Lauds"), 6:00 p.m. ("Vespers"), and the "Office of Readings," which can be said at any point during the day. Set alarms for 6:00 a.m., Noon, 6:00 p.m. to pray the Angelus. The Angelus is an ancient prayer focused on the mystery of the Incarnation. Did you know when the Angelus bells are rung at the Vatican, everyone stops what they are doing and prays together? Now, you can join them, too! Many of us spend a great deal of time in the car running errands, traveling to work, or shuttling family members to activities. Instead of treating this time as necessary drudgery, consider it for what it is: a serendipitous gift from God. Instead of turning on your favorite radio station, pick a Catholic audio podcast to explore your faith, re-listen to a homily from the prior weekend, or prepare yourself for the the upcoming readings. Most podcasts are short (fewer than 20 minutes) and perfect to share with your entire family when you are in the car. These talks will help deepen your knowledge of our faith and move your heart. You also will be amazed at the conversations that they spark with your passengers! Seton Parish - Come on, you knew this was coming! Our weekly podcasts cover all of our homilists and is a great way to re-listen to the homily from the prior week. Also, did you know we podcast our entire daily mass each day? Catholic Bytes - You don't have 20 minutes to listen to a podcast? This one teaches you our Catholic faith in 60 second chunks! Fr. Mike Schmitz - A rapid speaking priest from the University of Minnesota Duluth. He covers all kinds of relevant topics and is very popular with both adults and youth. He often combines his homilies into multi-week series that cover a particular theme and dovetail nicely into the readings of that week. Lanky Guys - Do you want to get more our of each Mass you attend? Are you interested in learning how the four readings (don’t forget the Psalm!) tie together? This podcast gives you the background and theme of the upcoming weekend readings in a fun, lively, and scholarly way. Come see why this podcast is a favorite among priests and bishops around the world. Bishop Robert Barron - Bishop Barron does a great job peeling back the top layer of the weekly readings and going a layer deeper to increase your understanding of your faith. And if you enjoy his gospel reflections, you might also like his longer interview style with Word on Fire. Pints with Aquinas - If you could sit down with St. Thomas Aquinas and ask him any one question, what would it be? Every episode of Pints With Aquinas revolves around a question, a question that St. Thomas addresses in his most famous work, The Summa Theologica. Learn why this podcast from host Matt Fradd is showing up on everyone’s podcast list. Every Knee Shall Bow - Evangelizing to others has always been a core part of our faith, but how can we do this in our daily lives? Each week Michael Gormley and Dave VanVickle will offer actionable advice to help you become a spirit-filled evangelizer. Fr. John Riccardo - A priest from Plymouth, Michigan, who is well known from local Catholic radio. He often delivers homilies that will speak to your heart and engage you to become a better Catholic. Catholic Answers - Each episode covers all kinds of common Catholic questions and topics. If you have friends or coworkers who ask questions about your faith that you find difficult to address, this apologetics podcast will help you find the right answer. It was only a few short years ago when you had to carry forty pounds of hardbound books with you to read Scripture or pray certain prayers. 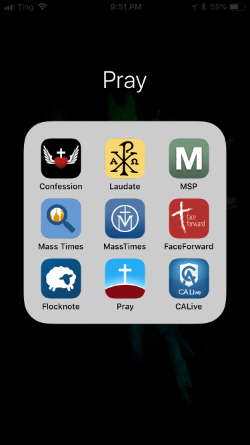 Now, there are thousands of Catholic apps that conveniently move all of this content onto your phone to help you educate yourself, pray, and prepare for a better relationship with God. The old saying, “you are what you eat” still rings true. Rather than cutting back on your social media consumption, why not change what you consume? Decrease or eliminate any content that negatively impacts you. Are there people you follow that continually post things that cause you frustration? Do you have inappropriate ads that keep showing up in your feed? Decreasing or entirely eliminating these posts is simple. On Facebook, click the three dots at the top of the post and click "Hide Ad" or "Hide Post." Over time, Facebook begins to learn what you don't want to see and removes them from your feed and you begin to feel better, too! Increase the content that positively impacts you. 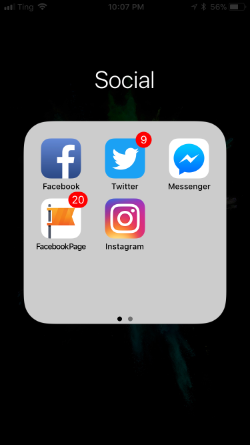 Begin to follow engaging Catholic content on your social media feed and you will find that your social media feed begins to find a nice balance. Aleteia - all the latest Catholic news and photos. Word On Fire - run by Bishop Robert Barron, find some spiritual fuel in your daily life. Ask a Catholic Nun - these sisters always have smiles on their faces and continually share content that will put that same smile on your face. Ascension - with an educational focus, they share videos and content, increasing your head knowledge and moving toward your heart. Catholic News Agency - you can never have enough information about what Pope Francis is up to and the latest Catholic happenings. Catholic Answers - do you have difficulty answering questions about your faith? These guys own "catholic.com," so they are an apostolate that know what they're doing. Pope Francis - apparently he is the pontiff in charge of our Church, so you might consider what he says kind of important. Mark Hart - he is the executive producer of "The Catholic Guy Show" and works at Life Teen. He even published a book of his tweets, so if it is book worthy, it is follow worthy! Common Catholic Girl - an anonymous Catholic account, but light hearted, fun, and educational. You wake up and what's the first thing you do? Check your email, of course! So, start your day right by signing up for a daily email where Catholic content is delivered in bite-sized chunks. Learn the Bible, explore the Catechism, pray some novenas, or discover a random Pope whom you never knew existed. Divine Mercy Daily - Every day you will receive brief reflections from St. Faustina, a mystic whose entire mission was to bring people closer to Christ. Morning Offering - Each morning you will receive an email that contains a daily meditation, the readings for the day, Saint of the day, and Liturgy of the Hours. Leave it in your inbox and you can reflect periodically throughout your day! Pray More Novenas - If you wanted to start a nine day prayer novena, but always forget half way through, sign up and receive your daily novena prayer in your inbox. Catechism in a Year - One of the major blessings in the Catholic Church is the Catechism. If you have any question about the Church, the answer is found in this book. It is the owner's manual of your Catholic faith. However, reading the Catechism from start to finish can be a bit daunting, so signing up with this mailing list will give you short passages each day. After a year, you will have read it in its entirety! Popes in a Year - From our current Pope Francis to our first Pope, St. Peter, we have a rich history of papal legacy. How much do you know about these leaders of our Church? Sign up and receive an interesting and often humorous email about each Pope. How often have you said to someone, "I'll keep you in my prayers" and then later in the day, completely forget to pray for that person? We've got a perfect solution: start keeping a "holy list" using the notes app on your phone. Keep a list of people's names to pray for - this ties together very well with your daily prayer alarm/reminders. These can be family members, friends, coworkers, but also don't forget to pray for those souls that are in purgatory! Keep a list of things to bring to confession - an alternative to this is to use the "Confession" app that lets you password protect these notes. The right music can turn your thoughts toward God even when you are not actively praying. Setting your alarm to wake up to some of these songs or using your time in the car to praise God though music can truly change your perspective toward what is important. Download praise and worship music on your phone and use it as your wakeup music. Some great artists to check out are Matt Maher, Brother Isaiah (a Franciscan! ), Luke Spehar, PJ Anderson, Sarah Hart (a Fisher Catholic graduate! ), and the Aly Aleigha Band. Download and listen to the “I Thirst" prayer. This was recorded live at Seton Parish during the Fall 2017 Alpha retreat. The prayer is attributed to Mother Teresa and was written as a message from Jesus to you, the listener. The piano accompaniment was written and played by Liz Christy and the recitation by Debbie Clegg. It is nearly impossible to listen to this recording and not have it tug at your heart. Download and listen to the “Divine Mercy Chaplet.” The chaplet was transcribed by St. Faustina in the 1930s and is typically recited using a standard rosary as a guide. This particular arrangement was recorded on Divine Mercy Sunday with vocals by Liz Christy and piano by Jim McQuaide. By far, this is the most downloaded file from our Seton audio podcasts. This particular version was recorded in April of 2017 and has been downloaded over 3,500 times. This article was inspired by this great podcast episode from the The Jeff Cavins Show. Did you enjoy this article or find something useful? Do you have additional suggestions? Reach out! We'd love to hear from you.